especially when energized at full throttle. This international alliance works well, since each member listens so closely, that mystical combinations often rise to the top of the ultra-selective heap! An alien transmission that speaks directly to those of us who love sounds from other dimensions. Dominic Duval, again -- not that we can really say that after his triumphal Equinox Trio disc of just a few months ago. And if that disc was unashamedly Romantic with its vibrato-heavy strings, this one is anything but. It comes from a rattling, scarified world where the debt to Cage which is so great in European improv is more in evidence than any of Duval's recent projects. Anyway, this isn't a Duval project as such, even if his bass, under the guise of some guitar stomp-boxes, plays the opening notes. Statements started life as a duo of Schlicht and Tammen; a very inventive guitarist in the tachist school -- no pretty arpeggios here, just crocodile clips and objects wedged between the strings -- and a dextrously rhythmic pianist. Tammen does, somehow, manage to keep this kind of playing interesting, probably just by the sheer amount of energy he puts into it. He works wonderfully with Rosen, whose nearly-but-not-quite-jazzy playing holds the group together and encourages them, on tracks like Living Proof, to ever freakier wigging-out. Accordingly he's higher in the mix than drummers normally are -- a brave choice, but the right one. For much of the time, he and Tammen seem almost to be working as a duet, which is no bad thing because the latter is extremely involving and Rosen bounces off him wonderfully. Schlicht, on the other hand, is mixed unusually low, which gives her more of an accompanying role even in a track like Machine Tools in which she and the equally-understated Duval play a spacious piece while the others create a backdrop of scratches and clicks. What's nice here -- apart from the contributions of individual players, especially Rosen and Tammen -- is the discrete identity they manage to lend to each track. On some, for example, Irmer's violin is invisible; on others, like Sticks in the Throat, his contribution is decisive. Very interesting he is, too, covering similar territory to Mat Maneri, and although he may not have the Chicagoan's layered sophistication as yet, he already has a strong sense of what goes where and his voice is already his own. And Duval? Well, again, he plays when he needs to and sits out when he doesn't The mutual respect within this group creates a lot of space in this way and a considerable amount of seat-edge anticipation goes along with it, as the hackneyed routes for group improivsation are frequently abandoned in favour of more unexpected stuff. They don't pussyfoot around -- much of this is fast and furious -- but the energy-music influence sits alongside a more rarefied New Music feel. The equivalent of an un-put-downable book, the sheer exhilaration in the music keeps you listening, and the group's flexibility keeps you guessing while making the many risks it takes pay dividends. 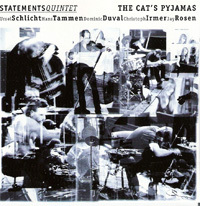 Statements Quintet is: Ursel Schlicht (piano) Hans Tammen (guitar), Dominic Duval (bass), Jay Rosen (drums) and Christoph Irmer (violin). American´s Duval and Rosen have worked with Mark Whitecage, Cecil Taylor, Ivo Perelman and many other notables within the modern jazz community. Ms. Schlicht is based in New York as Tammen and Irmer are active in various European music circles. The Cat´s Pyjamaswhile interesting, is deeply or in some instances, excessively conversational and at times a tough listen. The skilled musicianship and overall execution is fascinating, especially Hans Tammens´ wild and somewhat unusual approach to the electric guitar. As in most music of this ilk, it demands the listener´s strict attention. Not casual listening even by free-jazz standards; although, some would dare to call this "jazz". At times these pieces seem quite cerebral yet dutifully stretch the boundaries of one´s imagination and thought processes. The Cat´s Pyjamas is eloquent, very dissonant, probing yet fidgety and at times the extended passages are quite bizarre. The Cat´s Pyjamas may not tickle everyone´s fancy which also includes the modern or Free-Jazz advocate. Elektrifizierter Noise, wühlende akribische Energie dringt detailbesessen in den akustische Stoff ein, versucht es zumindest, knabbert am Molekularen, spaltet Haare, siebt Sand, verliert sich im Feinstofflichen, in der Beinahe-Stille... Aus einer stummen und dummen Ursuppe filtert das STATEMENTS QUINTET feinste Geräusche und Protoklänge. In solchen Nonsensepuzzleteilchen könnte ein zerbrochener Spiegel, eine verlorene „Sprache” zu entdecken sein. Gibt es nicht zwei ganz verschiedene Sehnsüchte, etwas unbedingt finden und etwas verzweifelt verlieren wollen? Oder etwa gar durch verlieren gewinnen wollen? "From the amplified intensities of 'Living Proof' and scratchy feedback textures of 'Ladybug's Attack' to spacey fractals in 'Sticks in the Throat', guitar player Tammen supplies an electronic fusion element. Duval's vibrant virtuosity shines in his arco solo in 'Machine Tool' while the quintet's interplay offers astonishing dialogues from the intensities of 'Three Forms' and 'Between Two Lines' to the delicate interaction of 'Relieve Power Supply." Deliciously subversive, this quintet takes the somewhat ordinary instrumentation of violin, guitar, piano, bass, and drums, and transforms it into wildly complex, deconstructive fragments of revolutionary sound. The group is led by eclectic pianist Ursel Schlicht and thrashing guitarist Hans Tammen (both of whom are credited with the "compositions.") The three strings (including the virtuosic Dominic Duval on bass and classically trained Christopher Irmer on violin) explode as a unit, able to twist and contort notes like putty. The addition of Jay Rosen on drums is brilliant, as he meshes perfectly. When the band is "on," as it is most of this recording, it produces sounds of remarkable beauty, especially when energized at full throttle.